I knew that wasn’t going to be missed. Everyone laughed as if being a blogger was a negative thing. And, I get it, Gary Vee is not a blogger in any sense of the word. But, being a blogger had gotten a bad rap recently, like bloggers are a dinosaur from the past or something. As we watch 2018 die a quick death, 2019 undoubtedly will find a lot of marketing “thought leaders” declaring the blogging is dead. They’ll write a really thoughtful blog post about it. (Seriously) And a lot of ignorant CEO’s will panic and start handing down orders to drop blogging and go all-in on podcasting or some such. Now, there’s nothing wrong with podcasting. But, blogging is nowhere near dead. The problem is, most people don’t understand the role that blogging is supposed to play. It’s kind of like someone trying to use a shovel as a screwdriver, and complaining that shovels no longer work. Let’s pull the curtain back and examine what successful blogging looks like, and how to understand the ROI in the context of the purpose of a blog. An effective blog content strategy in 2019 is much different than it was in 2010. Times have changed, and blogging has evolved. Use it the right way, and it’s very effective–like a shovel being used for digging instead of drilling. Use it the wrong way, and you’ll be the geezer sharing all the “blogging is dead” blog posts with your boss. As a side note: marketers, stop saying a medium is dead on the very medium you say is dead. It’s stupid, and clickbaity. Yes, it gets a reaction, but it doesn’t do you any favors. Getting a reaction is not the same as building an audience based on expertise. The following is the process I use in building a blog content marketing strategy for B2B clients. It works because it’s using a blog to its fullest potential. Then, we’ll talk about how to measure the success of blogging the right way. Too many b2b bloggers haven’t really thought about their categories. If you’re going to see success, you can’t blog with buckshot - spreading posts around hoping they hit. You need a sniper rifle strategy, one that is laser-targeted on the mark. We took a method we heard about from the Traffic and Conversion Summit, and adapted it. This method is simple: find the 5 subjects your target personas care about the most in correlation to your product or service. You can only choose five. These become your blog’s categories. So, for Lean Labs, we have a category for Organic Marketing–that’s one area our clients care about and something we’re really good at–it’s one of our core offers. Other categories that could work for us are things like: email marketing, lead generation, paid search, conversion rate optimization, SEO, etc.. We had to brainstorm all the topics, and then we picked the top five. Now that you have your five categories, we’re going to drill down 2 more levels of five. So, for each one of your top–5 categories, you need to brainstorm the top five issues about that one thing that people care about the most. For organic marketing, the 2nd level of five could include SEO, blogging, link building, etc.. When you’re done, you should have five top-level categories, and 5 subcategories for each. In total, you will have 25 buckets of possible content. When you drill down the 3rd level, you will have 125 blog posts to create. And, this is just the foundation for all your future content, but it’s a necessary foundation. We will save the 3rd level drill down for when we build our 90-Day strategy in Step 4. 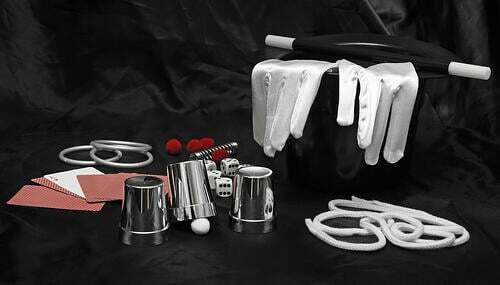 Now that you have 25 buckets for content, we need to do some preliminary keyword research for each of those buckets. I prefer to use SEMRush, Google, and UberSuggest to do my keyword research. If you want to see the process of how I research keywords, you can download our free organic traffic guide. The main goal is to identify the top 50 keywords for each bucket. In a nutshell, you need 50 keywords that are hyper-relevant to the topic, have a worthwhile search volume, and are within your competitive reach. If your domain authority is low, you’ll want to target less competitive keywords. If your domain authority is higher, you can make an educated guess which keywords are within your reach, and which ones are just too difficult to target. 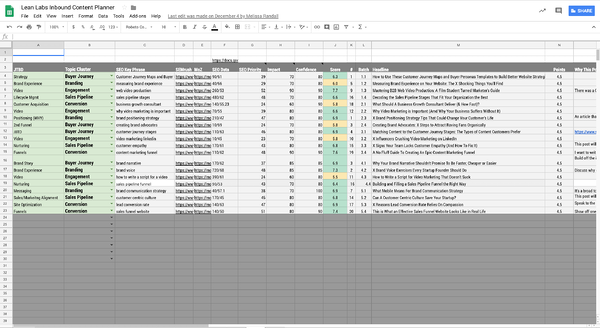 At the end of the day, you want to have 50 possible keywords for each of the 25 topic buckets. While blogging should be a part of your marketing strategy, it can no longer be the only thing you do. Yes, you can still have success, but it’s much easier to make an impact if you diversify your content across multiple mediums. With that said, you should identify the maximum quantity of posts you can publish without sacrificing quality. And, whatever velocity you pick, consistency is a major part of long-term success. So, be strategic. If you can’t create 4 posts per week, you don’t want to plan to publish 4 posts a week. You may hit it for the first 2 weeks, and then you fall off the wagon. Then, suddenly several months go by and you’ve published 2 or 3 posts total. I’ve seen it way too often. When you put your super-aggressive publishing schedule on the back burner, it usually stays back there. So, make sure you plan so that you exceed your goals, and not set them so high they hit back-burner territory. Seriously, consistency is a huge key when it comes to organic marketing. And, organic marketing is where blogging still shines. So, consistency is the goal, not super-high frequency out of the gate. We’ve found over and over again that the minimum effective publishing rate is 2X a week. If you can’t publish at least two blog posts a week, you will see very, very slow growth rate. In fact, we had a client that only had enough budget for one post a week. After 5–6 months of no results, we started writing an extra post a week for free. Within a month of that, we saw the traffic start to take off. And, we’ve proven that scenario over and over again. So, if at all possible, publishing twice a week at the least is preferred. Zooming out to a long-term picture, the third level of drilling down is to publish five blog posts covering each of the 25 subcategories of the five main categories. That means your foundation is 125 blog posts strong, and your first few strategies should be 100% aimed at covering every one of those bases. So, if one of my 5 main categories is organic marketing, one of the five subcategories could be keyword research. My goal is to write five blog posts that cover different aspects of keyword research. Then, another subcategory may be SEO. So, I would write 5 articles covering different aspects of SEO. At a 2 per week cadence, you will probably need to plan out 25–26 blog posts for a 90-day strategy. We recommend going with 90-day rolling strategies, as that allows you to focus on executing, and not constantly being paralyzed by analysis. It helps to have a healthy amount of analysis to measure, learn, and evolve with each strategy based on what’s working and what’s not working. And, 90 days seems to work perfectly for the balance between strategizing and executing. If you know you need 25 posts, you need to brainstorm 50 potential topics. Then, cherry-pick the ones you feel will work the best. So, for each of the 25 buckets, you can brainstorm two posts. Or, you can focus on a single category, and brainstorm 50 posts for the five subcategory buckets. It doesn’t really matter how you spread it out, because for the first five 90-day calendars, you’ll be building out that 3rd level of your content foundation. I like to load all my chosen keywords into a spreadsheet, and then brainstorm a title for each keyword. These titles are considered “working titles,” but it gives me an overview of the topics I want to cover to build the 3rd level of my content foundation. Then, I cherry pick my favorites to fill out the calendar based on my chosen velocity. We try to brainstorm twice as many topics as we need to meet the velocity, that way we can cherry-pick our favorite. And, if one post goes south, we have a stable of ideas we can easily pull from to replace it. Once you feel good about your topics, focus all your energy on executing that strategy. Don’t try to pivot your strategy in the middle. A lot of people panic when they don’t see immediate results – there are no immediate results with B2B blogging if you’re building for the long-term. So, don’t worry about the results, just execute. Then, at the end of your 90-day calendar, when all the posts have been written, you can do an analysis to see what worked and what didn’t work. You can analyze why, and then make adjustments for your next strategy. Quick Note: This post is about building a strategy for the long term, which we’ll talk more about in the last step (promotion). But, when you build for the long term, your posts aren’t considered underperforming within the first six months of publishing. For a lot of our clients, posts can sit in some kind of hibernation mode for months on end. In fact, for one particular client, their blog posts usually start skyrocketing in traffic at the 8-month mark. We see that happen consistently, which means measuring the success of a post a week after we publish it is a foolish practice. If you trust the system, and just keep executing great strategies, you will see results. I would be remiss when talking about building long-term ROI, to not include lead generation. For each of your five main categories, you need a lead magnet. And, it’s even better if each of your 25 subcategories has a hyper-relevant lead magnet. So, going back to our example of organic marketing, I need an organic marketing lead magnet to include on all my organic marketing posts. But, it’s even better if I have one for the subcategories as well, so that when I’m writing on SEO, I can include an SEO lead magnet in those posts. Hyper-relevant lead magnets increase lead generation by a boatload. So, don’t pass this up. Your blog posts are probably all going to be centered around TOFU topics, so you need plenty of TOFU/MOFU lead magnets to give the reader a logical next step. If the lead magnet is relevant to the next step, it will convert like gangbusters. For example, if I was writing the post “5 Ways to Increase Lead Generation,” and I had two offers – and one was “Organic Marketing Guide for Lead Generation,” it would convert okay. But, if that posts referred to landing page conversion rates, and I have a guide on how to improve landing page conversion rates, it will convert much higher. For another example, scroll up the CTA above. You’ll notice I added it right where it makes the most relevant sense. It will increase the click-through rate of your blog posts, and it will have a dramatic effect on the conversion rate of your landing pages as well. We used to just publish a post and wait for Google to rank it. This process takes a long time. It still works, but not as fast as it used to. If you want your posts to rank faster, you have to give search engines the signals that a blog post is worth ranking. There are three ways to do this: the first is manually sharing it with people who can give a signal, like in forums or asking for influencers to link to it, etc. The second is to use paid amplification–paying to advertise your content. Paid amplification works! The third way is to multipurpose the content, and create signals on your own across all of your content outlets. This is my least favorite way to promote a post because it can get spammy very fast. But, basically, you’re manually sharing this post with people who might share it as well. You’re reaching out to people on social or in forums, and sharing the content with them. You can do “link building,” etc. You have to be very careful because when you talk about building signals, it’s really easy to gravitate toward grey or black hat tactics to get signals quickly. This works for a while, then Google will eventually slap you and kill your company. If you do it right, it’s time-consuming. So, get ready to do a lot of work. Paid content amplification is awesome for a lot of reasons, but you have to understand the purpose. Again, paid content amplification is not like running ads to an offer. Conversion rate doesn’t matter when measuring success. What you want, is to get the content in front of new people, and get the clicks to the content. Then, you can pixel the audience, and remarket your lead magnets to them. But, the purpose, again, is not for a conversion rate. It’s buying attention that Google isn’t getting you organically yet. And, it’s worth it. This is my favorite way to build ranking signals. When you have a great post, make a slide deck out of it and upload it to places like Scribd or Slideshare. Make video versions of your post, and upload them to Facebook, Instagram, and YouTube. And, if it’s available, link back to the original post in the description. Make images of some of the best quotes from the piece, and post them to Facebook and Instagram as memes. The more content you can create on external platforms, that send a link back to the original post, the more chances you have at finding an audience, and bringing them to your site, where you can at least pixel them, but hopefully, you can convert them to a lead. Every single signal helps Google to appreciate your content even more. A lot of people misunderstand the purpose of the blog, and they apply KPI’s that are not relevant. Again, if you measure the effectiveness of a shovel based on how many screws you can drive, you won’t even appreciate the shovel. And, if you try to dig a ditch with a screwdriver… well, you’re an idiot. If you’re reading this post, I’m assuming you’re not considered a thought leader – and your blog is not bringing you the results you want. So, I’m going to make recommendations based on that assumption. The caveat, though, is that I understand, for some people who have an established audience, the blog purpose drops further down the funnel. But for most people, having a lower-funnel blogging strategy will fail because you don’t have the audience yet. So, for most people, your blog should be a top-of-funnel generator. Meaning, your blog is an introduction to strangers. These people aren’t going to visit your website or store because they don’t even know you exist. And, this is where blogs really shine. The purpose of your blog needs to be to address the concerns of your target audience, and build a relationship with them before they have even decided they need your service or product. Lean Labs creates content to answer (or address) that question because that adds value to the prospect in advance, and it introduces them to our brand. And, that is the goal. Period. The method of reaching that goal is to rank for those searches. And, to do that, you need domain authority. 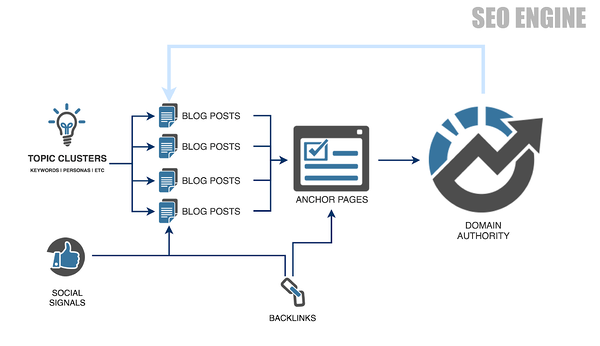 Your blog posts build domain authority as a whole. Again, if you’re in the 99% that don’t have a rabid fan base, your KPI’s shouldn’t be the same as the 1% that do. Too many people get distracted trying to attribute revenue to individual blog posts without an established audience, and they are barking up the wrong tree. You’re measuring the shovel by the screws. If you’re building an audience, your blog is an entity. It’s not a bunch of individual entities, it’s one big conglomerate. And, you must measure it as a conglomerate. The whole engine needs to be measured. You will have some blog posts that get thousands of visits right from the start. And, you’ll have some that get only a few. Neither are failures unless one or the other was completely off topic. Both, are attributing value to your domain authority. And, as you gain more domain authority, those older posts with only a few views will rank higher and higher. This is why some posts can take a year before they start generating organic traffic: they are waiting for the engine to gain enough speed to propel them to the top. There’s no need to micro-analyze individual posts if these three KPI’s are growing satisfactorily. Doing so will induce paralysis by analysis. Instead, you should focus on creating the content that deserves to rank, and watch as these three KPI’s go up. What you will notice, is that as these begin to skyrocket, so does other KPI’s across the business. Because organic marketing affects more than organic metrics. In fact, we mentioned a client earlier that we started adding a blog post a week for free. After 8 months, they had very little movement in these KPI’s. But, after 12–18 months, their business continued to grow as their traffic skyrocketed. And, two years in a row, they had their best years ever. Now, their website KPI’s weren’t super impressive. But, they couldn’t deny the fact that as organic traffic and leads went up, there was also a spike in people calling and customer inquiries through other channels–people were undoubtedly finding them in search, and then calling to buy. Trying to attribute this growth to individual posts is impossible, and this client was mature enough to recognize that. And, they have reaped the rewards of a long-lasting supply of “free” organic traffic and leads. The hard truth is that organic traffic is difficult to build. Well, it’s not difficult, it just takes time. We’ve seen a lot of people get impatient with the process and quit right before their breakthrough. Then, they go years with flatline traffic as they bounce from one “get rich quick” method to another. Those who don’t freak out when a post gets little traffic are able to rejoice when 8 months down the road, Google is suddenly sending thousands of visits a month to that blog post. That’s building for long-term success. Some of our best-performing posts are 2–3 years old, and they are still driving traffic and leads. And, some of our newer posts are disappointing by their current performance. But, we’ve been in this game long enough to realize, we’re not measuring success by blog post, we’re measuring success holistically. You have to build the system. And building the system means letting time work in your favor, which takes trust in the process. And, when you have the system, and you trust in the process, you focus your energy on doing the work. If you do the work, and trust in the process, you will enjoy the results. Build the system. Trust the Process. Do the Work. Get the benefits.